The MAC OLM converter not only exports emails from OLM files, It also exports attachments, associated with particular email. The software exports all attachments from MAC Outlook 2011 & 2016 without any hassle. This OLM file Converter for MAC allow you to convert MAC outlook OLM to PST, EML, MSG, MBOX, EMLX & PDF formats. After conversion of MAC OLM file, the Resultant file can be used on any Windows or MAC email clients. 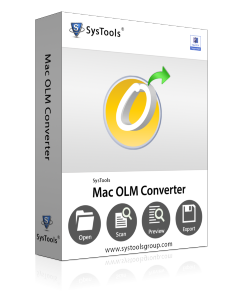 The MacWareTools OLM Converter has a functionality to convert multiple MAC Outlook OLM files at a time. You just need to Click on Add folder button to add the folder (Containing multiple OLM files) and proceed with next steps for bulk conversion. This OLM to MBOX converter for Mac allow you to export OLM file emails with date filter option. This will help you to extract only required emails from OLM file. For this, you just need to select the date range and the MAC OLM file Converter will export the emails from that date. Software has an Additional feature for saving OLM files with desired naming convention. While saving the converted data in EML, MSG or EMLX files, the MacWareTools OLM converter allows you to provide naming convention like Subject, DD-MM-YY+ Subject, DD-MM-YY+ From etc. This MAC Outlook OLM file converter is capable to export OLM to MBOX, PST, EML, MSG, EMLX and PDF formats on MAC OS X 10.8 & above versions. Also it converts olm file of MAC Outlook 2011 & 2016. I never thought that transferring files from OLM to MBOX would be so easy. But after using this software I can say that it is really easy that I had done it in simple clicks. Thanks to the developers for such a great development. I am impressed with the Selected Date feature of this software. This tool made my work easier. Hats Off to you MacWareTools, you have done a great job. This is an amazing application that I have been using till now. I used to find difficulty to export OLM files in bulk. But after while using this I realized this is the best software I ever used. I will suggest this tool to my friends and colleagues also. This tool is Great. I did not find any difficulty while using it. It is really easy, accurate, safe and capable of processing a large amount of data. A single tool with lots of options to perform conversion. 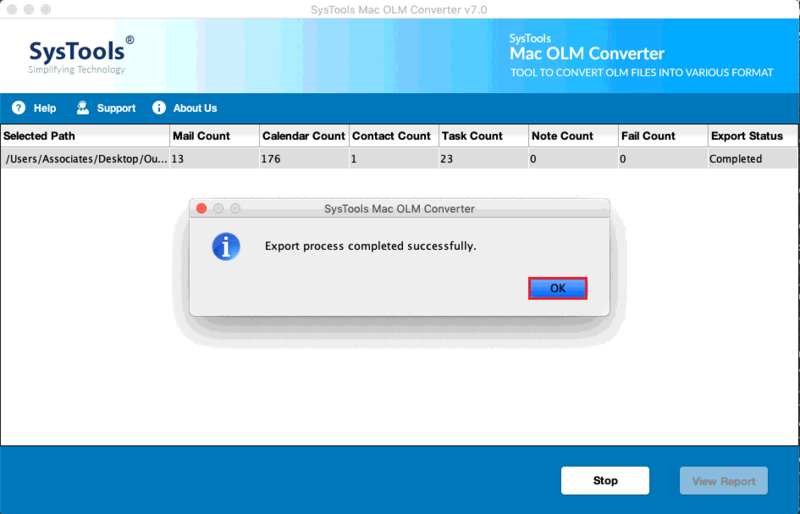 Demo version of Mac OLM Converter enables you to export only 100 emails from each OLM file. 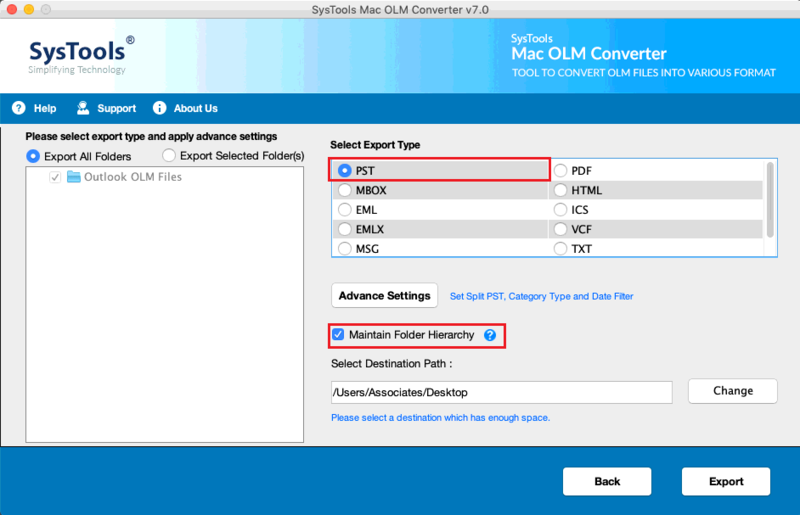 How to convert OLM to PST on MAC using this OLM File Converter for MAC? Can I convert Outlook 2016 OLM to MBOX file using this software? 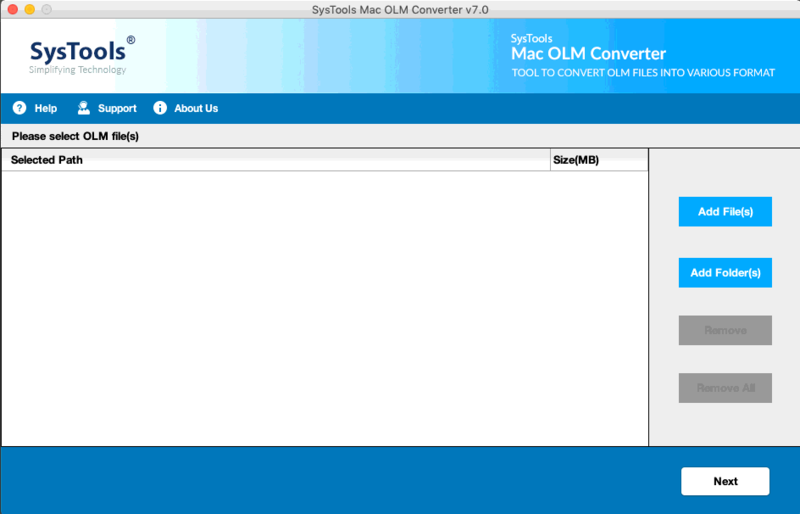 Yes, the software allows you to export OLM to MBOX, PST, EML, MSG, EMLx & PDF formats. Can I convert Multiple OLM files at a time? No, Software enables Add Folder option to export multiple OLM file at a time. Does the tool support to run on MAC OS 10.13? Yes, Software is well capable to run on MAC OS X 10.8 & above versions.